Delray’s roots go about 4,000 miles – to Germany! Every time I think that coincidence is just that, I discover something that somehow tells me I was meant to find it. I had noticed Germantown Road in Delray Beach off of Congress Avenue and wondered how it was named. I searched through Google and found a posting on HistoricPalmBeach.com where the best guess was that the German immigrants in the town of Delray had their farms and small cottages away from their houses in town. That made sense to me as I know that is a common practice in Germany to build a tiny cottage, maybe 12 x 12 feet, near your plot of land. It is used as a summer cottage for weekends and to store tools. Hofman. 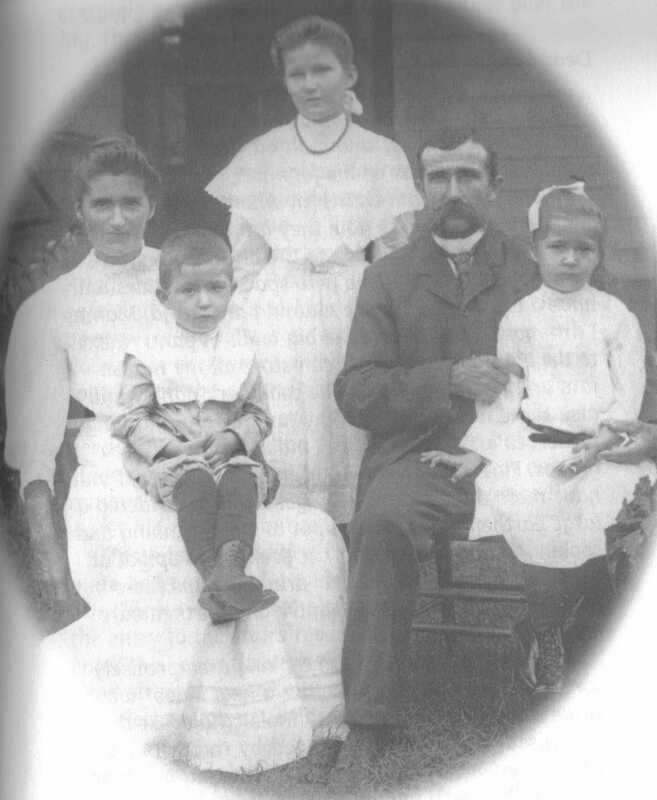 The book tells the story of Adolf Hofman, his wife Anna and their children through letters that Adolf and Anna sent home to relatives in Germany. I bought the book and figured it would help me find out more about the German immigrants in Delray Beach. What I would find was truly amazing. When I learned there were German farmers in Delray Beach, I had thought they probably would be from southwestern Germany; there the people are called the “Schwaben,” or Swabian in English. They have a reputation as a hard-working, frugal people who love their land and dream of building a house. As I started reading the book, sure enough, Adolf Hofman was from Mönchhof, about 30 miles northeast of Stuttgart, which is the capital of the southwestern German states called Baden-Württemburg, which is where the Swabian people live. The book then tells of his wife’s family history, and gave her maiden name and village – Anna Maria Dreher from the village of Erpfingen. Dreher? Could it be that she was related to Paul Dreher, the one-time West Palm Beach parks director and founder of Dreher Park Zoo? Indeed, it was true; Paul Dreher was Anna’s nephew. As I blogged last June, my uncle in Germany is friends with a descendant of the Dreher family and he lives in Erpfingen, the village where Anna was born. He was here about 17 years ago to visit his Uncle Paul Dreher. So with all of the millions of German immigrants that came to America, I manage to have a direct connection to the ones here locally! The book is an excellent read and conveys how hard life was in early South Florida. Hofman arrived in New York in 1895 and first went to a family member’s farm in Illinois, but he had heard of the bounty of South Florida. He had been trained in agriculture in Germany, and had apprenticed at several large estates there. He took the train as far south as West Palm Beach, where he met with William Linton and several others pioneers. They took a boat down Lake Worth, then a barge down the narrow Florida East Coast Canal. Hofman bought his first five acres from Linton. He lived in a tent while he built a small cabin. He then sent for his wife and baby daughter Annie. After sailing across the Atlantic, they took the train to Delray (then called the Town of Linton). Hofman subsequently built a fine two-story house for his growing family. He bought more land so that soon he had 60 acres that stretched from the canal to Swinton Avenue. On the western part of the property he grew pineapples and on the eastern part fruits and vegetables such as mangos, oranges, bananas, tomatoes, beans and potatoes. He continued to buy land east of the canal on the barrier island to grow more vegetables. As the land boom of the 1920s hit, he began to subdivide the land. and disease such as malaria, yellow fever and typhoid. Through their farming they always had plenty to eat, but profits were at the whim of the weather and the high freight charges of the Florida East Coast Railroad. Hofman also made other contributions to the community such as being a founding officer of Delray’s first bank. As years went on, Hofman sold his land on both sides of the canal. Many of the Royal palm trees he planted are still to be found on Seabreeze Avenue on the east side of the Intracoastal Waterway. The book does not touch on this subject, but I am sure Adolf and Anna did not have it easy during the two World Wars, being naturalized citizens from Germany. I am so pleased that their grandson took the time to put the book together from all the letters sent back to Germany. The oldest daughter Annie stayed with her parents until each passed away; Anna in 1945 and Adolf in 1953. Annie stayed in the family homestead until 1965, when it was sold; unfortunately it burned the same year. What a treasure that house would be today. Today all of Adolf’s and Anna’s lands have houses or businesses on them. I went by there and did notice some large mango trees lining the back of the lot where their house once stood; I can only hope they are from the seeds of some of his trees. The pioneering spirit of America’s immigrants is what shaped so many communities, even right here in our backyard. 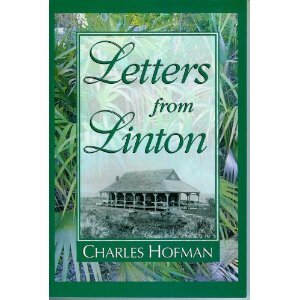 The book “Letters from Linton” is published by the Delray Beach Historical Society and can be purchased at several local bookstores and the Historical Society of Delray Beach, or online at Amazon.com. Palm Beach. No other county name probably brings to mind wealth, the tropics and Florida. 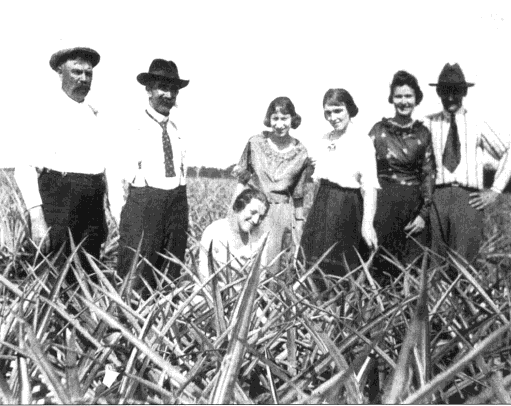 When Palm Beach County was a part of Dade County before 1909, farming was the way that most of the early homesteaders and pioneers made their living. Traditional crops such as tomatoes, beans, and potatoes were grown, but the unique sub-tropical climate of South Florida allowed more tropical and exotic fruits to be grown. And the king of all those early crops was the pineapple. Most people probably do not know that Palm Beach County was once the largest pineapple growing area in the continental United States (at that time Hawaii was still a territory). Pineapple growing in Florida goes back to 1860, when Benjamin Baker planted the first pineapples in the Florida Keys at Plantation Key from plants he had brought in from Cuba. By 1876, pineapple farming was spreading and Jensen Beach became the pineapple capital of South Florida. Captain T.E. Richards started his plantation on Eden Island, roughly where Sewell’s Point is today. He had moved his plantation further inland, away from the coastal barrier islands as the bears along the beach enjoyed his pineapples too. Japanese, led by Jo Sakai, planted hundreds of acres of pineapple. John Clarke, who gave his name to Lake Clarke Shores, also had a pineapple plantation and packing house near where Parker Avenue is today. 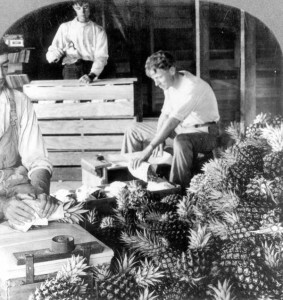 At the peak in 1909, 5,000 acres were planted in pineapples, yielding over 44 million pounds of fruit. Most of the fruit was shipped out fresh; some was canned in Mangonia or Delray Beach. 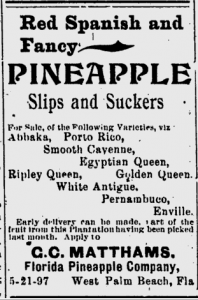 Given that Palm Beach County was named in 1909, I wonder if some did not consider the name “Pineapple Beach County.” Good thing they didn’t, because the end was near for pineapple farming in South Florida. It was the perfect storm – plant disease, freezes and cheap imports. 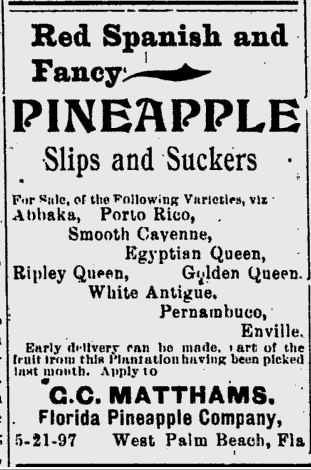 The mid 1890s saw many devastasting freezes that wiped out central Florida pineapple plantations. In Palm Beach county, many farmers had been noticing that their plants were yellowing and dying; they called it the “pineapple blight.” The Yamato Colony lost their entire 1909 crop to the disease, caused by mealy bugs and nematodes. By 1912, Henry Flagler’s Florida East Coast Railroad had reached Key West, allowing for the importation of cheap pineapples from Cuba that could be carried north via rail, unlike Florida pineapples which were shipped north via schooner. Prices plummeted as local farmers could not compete with the cheap Cuban imports. war, Morikani bought land west of Delray Beach, which today is The Morikami Museum and Japanese Gardens. Le Chalet Boulevard is today. His 80 acres of pineapples was the largest plantation in the continental United States in 1941. He had learned the technique of forcing the pineapple to flower so that his crop was ready at Christmas, instead of the normal June-August season. His place was called “Flatwoods Plantation” and grew many varieties of pineapples that are no longer available commercially such as Abakka, Natal Queen, and Pernambuco (which is supposed to be the most delicious of all pineapple varieties). These old varieties have saw-tooth leaves that are truly spiky. 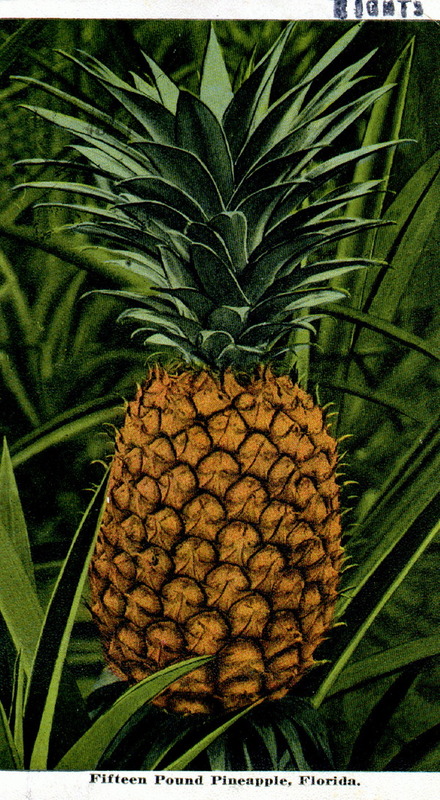 In 1962, it looked as if pineapple farming might make a comeback in South Florida. With the Cuban trade embargo, no fresh pineapple was available; all the Hawaiian pineapple was canned as it was too far and expensive to ship as fresh fruit. A 1962 article in the Palm Beach Post mentioned P.K. Platts. who had a 10 acre farm near Fort Pierce. Morikami also continued to grow pineapples west of Delray, and William Brooker had a pineapple stand into the 1970s in Jupiter. Brooker’s stand was located on Indiantown Road, just west of Sims Creek. I can still remember stopping there with my father to buy pineapples. They were small compared to store bought ones, but much sweeter as they were plant ripened. He farmed his plantation until shortly before his death in 1975 at age 93. I don’t know when the Flatwoods Plantation ceased farming, but surprisingly much of the land is still empty along Old Military Trail in that area. pineapple. Next time you buy a fresh pineapple (probably the Smooth Cayenne variety), carefully twist off the green top. Remove some of the small leaves from the base, and underneath you will see some small roots already forming. You can root it in some water, or just place the top in a pot or in your yard. They have a very shallow root structure, so they do well in a pot. They love sun, but not too much water. After about 18 months, in January or February, your pineapple will bloom. The center of the plant will turn red, and small purple flowers will emerge to become the pineapple fruit. As the fruit is forming, a new plant will emerge from the ground. You can plant this “slip” or let it stay on the mother plant to bear again. 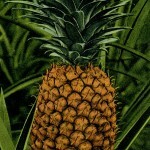 The pineapple should be ripe in July or August; the aroma from a ripe pineapple is like nothing else. Then you can experience an old part of Florida’s agriculture history, one sweet slice at a time. This article was researched through the historical archives of the Palm Beach Post and the Tropical Sun, the Lake Clarke Shores Town website, and the Morikami Museum website. Special thanks to Robin Potvin, archivist for the Town of Jupiter, for information on William Brooker.